Once a year, the Hubble telescope snaps photos of our solar system’s gas giants for the Outer Planet Atmospheres Legacy (OPAL) program, an initiative to help us better understand the four planets. On Thursday, NASA released the latest OPAL image of Uranus — and it offers a stunning view of a mind-bogglingly massive storm currently raging on the icy planet. 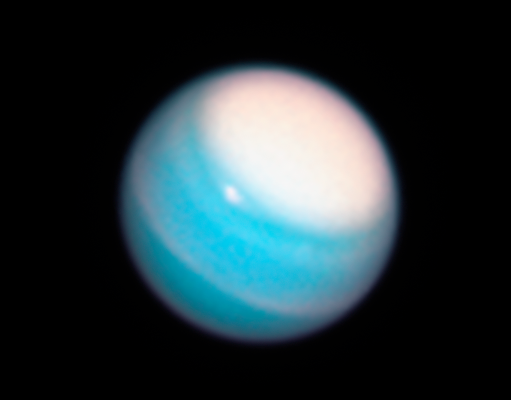 The storm is impossible to miss in the new photograph — it blankets Uranus’s north pole in a cloud of white, making the planet resemble a blue Easter egg that wasn’t fully immersed in the dye. According to a NASA blog post, scientists believe the striking image was made possible by something that sets Uranus apart from every other planet in our solar system: its dramatic tilt. 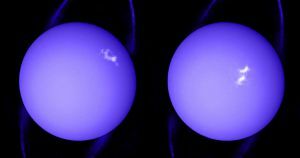 Uranus essentially spins on its side, with an axis tilt of 98 degrees. For comparison, the Earth’s axis has a 23-degree tilt. That means Uranus’s north pole points almost directly at the Sun during the planet’s summer. The middle of that summer season is approaching, thereby granting Earth this stunning view of Uranus’s north pole and the storm on it, which NASA posits was caused by changes in the planet’s atmospheric flow. Just like a meteorologist can’t predict weather patterns on Earth from a few photos, astronomers need a series of images of the atmospheres of other planets, taken over long periods of time, to reach any worthwhile conclusions about their weather trends. The hope is that the OPAL program will provide this valuable data, helping scientists better understand the atmospheres and weather patterns of the planets circling the outskirts of our solar system — and, in the process, providing us with stunning images like the one released on Thursday.